The sculpture spelling out "NEWBORN" in giant yellow letters, unveiled in Pristina on 17 February 2008, after Kosovo declared its independence from Serbia, has become Pristina's most photographed object and provides the city with an identity. The sculpture has received international awards; art lovers embrace it as a unique idea and design. However, if you look around the art installation located in a "temporary" city centre location, the new and fast-emerging buildings do not carry the same modern image. "Pristina's buildings reflect the frustration of the builders and of the ones running the construction business," says urban designer Eliza Hoxha, referring to the disorganized shape of the buildings, raw colours, and the unprecedented pomposity of each individual highrise building that adds to the already disorganized landscape of urban Pristina. This phenomenon especially emerged in Kosovo after the 1999 war: the owners apply quick construction methods and only cared about spending their money, while closing their eyes to architectural norms, and tending to neglect the appearance and the design of the buildings. Eliza, 35 years old, is a Pristina-born architect. She thinks that each builder wants to flaunt the size or "beauty" of their building. "And the facades they use are ugly - you can see their frustrated spirit in the facades." Real estate continues to be the most attractive investment in Kosovo. 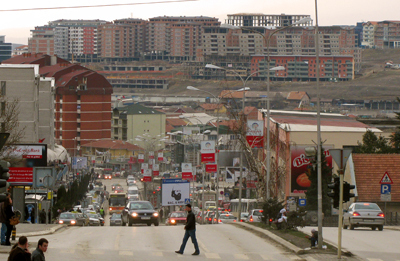 According to real estate agencies, the price of apartments and houses in Pristina has increased by more than 100 per cent since the end of the war in 1999, while the price for land has increased by about 300 per cent in the same period.Experts say that the apartment prices are not real, considering the quality of the buildings. Some argue that the high interest in property reflects people's need for new apartments; however, others say that the buying potential is not this high. Pristina's population has increased from just more than 100,000 in 1981, to an estimated 500,000 inhabitants today. The population particularly increased after 1999. Since 1980, Kosovo has had no real census, but doubtlessly Pristina is becoming a metropolitan city. Some experts think that an urban plan without adequate population statistics could not be accurate or complete. The best evidence of Pristina's overcrowding is the never-ending need to queue in public service offices, which have turned into a chronic problem for the municipal authorities. The struggle to obtain identification documents results in long queues that sometimes last days. Citizens were relieved at the news that through a decentralization scheme the municipality will, in March, open several offices across the city, which, for years, seemed to have no apparent solution. The lack of organisational skills was first blamed; however, others claim that the currently limited facilities and infrastructure in Pristina cannot provide services for more than 400,000 inhabitants. The construction of hundreds of low and high buildings proceeds daily in the Pristina region, despite lack of official construction permits. Outnumbered by the unlicensed buildings, the municipal planning officials constantly consider hundreds of cases. Construction in Kosovo is not based on any urban planning, according to architect Astrit Hajrullahu, a former official in the Ministry of Environment and Urban Planning. He claims that most of the developing and strategic projects, as well as the urban plans regulating construction have basic problems. "Also, one should blame the laws, which are not updated and should be changed," says Hajrullahu, after confessing that he had to quit his position because he failed to implement working methods to benefit society. The Kosovo Assembly has replaced the old legal system with freshly adopted laws regulating urban planning as well as construction. These laws, however, lack coordination necessary to function as a whole. Mr Hajrullahu thinks that the inadequate laws cannot cover the complex process that includes spatial planning, licensing of architects, as well as illegal construction. The architect also notes the problems currently met by the new urban planners, who seek to involve citizens, businesses and all stakeholders in the process. "Public debates take place, but in the end no remarks are considered," Hajrullahu says, while stressing that problems usually begin when a certain project starts to be implemented. Many in Kosovo find it difficult to understand the new urban development. To make an extra effort to explain the city's development, urban planner Eliza Hoxha has a blog on a daily newspaper's website. "Planning is not seen as an inclusive process, that's what pushed me to address directly the public," says Hoxha, adding that war and crisis have caused Kosovo society to suffer a gap in urban culture; citizens consider public spaces as someone else's and not theirs. Planning should be an open process interesting the citizens, businesses and the authorities, says Hoxha. "Citizens must be convinced that the city belongs to them, and they must love it." If the old citizens are not showing enough love to the city of their birth, than Alan Fox certainly does. Fox is a London-based businessman, who joined with a Kosovar partner to construct high buildings in capital Pristina. "From the day I arrived, I loved the people, the lively streets, bars and restaurants," says Fox adding that "I decided to do something for these people, since they deserve better than the current ugly buildings." He says that through his company, Chelsea Point, he is starting to present a different attitude towards construction. "Our method of building is quite slow. We build two layers of building, and as we apply standards, it also raises the price of the building," says Fox. He notes the difficulties to convince Kosovo builders to apply safety standards; construction workers refuse to wear protective helmets and other security measures. He adds that the global financial crisis has hit them, but they are not thinking of stopping the business. Despite the crisis, diaspora Albanians dominate the list of buyers at this company. "Our primary target are people living outside Kosovo that have been used to standards applied in England or in Germany, and who want to have the same here," says Fox. Chelsea Point claims to have paid all the construction permits, and sells apartment with prices from €800 to €900 per square metre. This price is in line with the average for new apartments, which vary between €800 and €1000 per square metre. However, illegally constructed apartments are noticeably cheaper, and are sold for between €500 and €700 per square metre. Muhamet Gashi, spokesman of Pristina's Municipal Assembly, says that the Pristina Municipality can only guarantee technical standards if the buildings have obtained a license. "We are licensing all buildings that fulfil technical and urban standards of living. Therefore, people can trust the quality of their purchases," Gashi said. Nevertheless, illegal construction firms attract customers with lower prices. Currently, many active investors do not have any background in the construction business. Throughout the city, illegal entrepreneurs often agree with owners of adjoining houses to demolish their property in compensation for apartments in a newly constructed building. Later, suppliers participate in the same scheme: steel, cement, bricks, windows and doors become part of the exchange for apartments. In the end, Pristina has another highrise building in front of the apartment window of a neighbouring complex, which was also built without permit two years ago. Mr. Hajrullahu thinks that house owners who agree to exchange their property for a new apartment have much to lose, since the quality of the new buildings is far below the required standards. He also stresses that Pristina and its inhabitants are losing a chance, since these investments will soon fail. Hajrullahu also regrets that the new public buildings designed to host the recently established Kosovo institutions do not create new symbols and landmarks for this city's architecture. Apparently, Pristina and Kosovo will cling to the original NEWBORN sculpture, as the only symbol of a different model of urban development.